Jeffrey Nothing, formerly the haunting voice and co-founder behind Cleveland's pioneering alterna-metal and industrial collective MUSHROOMHEAD, has resurfaced with his solo project Jeffrey Nothing (also known as NOTHING). 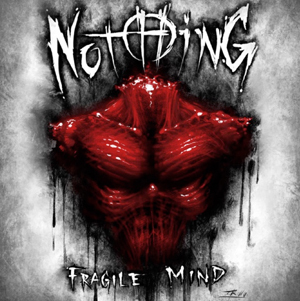 Releasing today is a brand new single “Fragile Mind". The track is available now for download and across all streaming platforms HERE. Jeffrey Nothing has re-teamed up with fellow former MUSHROOMHEAD guitarist Thomas Church following their departure from the band this past March 2018. Also appearing is former MOTOGRATER and THE BROWNING drummer Noah “Shark” Robertson and vocalist Ian D, bassist Kahler Hatrix, among other members yet to be announced. Produced and written by Jeffrey and Thomas Church and mixed/mastered by Joshua Wickman (Dreadcore Productions) and Matt Johnson (Revelation Studios), Nothing has again teamed up with acclaimed tattoo artist Tony Kelly to design the artwork accompanying the music. Watch the lyric video for “Fragile Mind”, which was produced and edited by Rob Neilson of Wired Digital below. Jeffrey Nothing is the co-founder and former haunting voice behind Cleveland’s pioneering alterna-metal collective MUSHROOMHEAD. His distinct vocals had driven MUSHROOMHEAD’s frightening and extreme performance style, garnered them an enormously devoted cult following and allowed them to sell more than one million albums worldwide. Jeff released his debut solo album The New Psychodalia in 2011 which included the single “Sin O’ Cism". In 2013, Jeff starred in the movie 13th Sign. Jeff was also the singer of Cleveland-based thrash metal band HATRIX, as well as fronting the band PURGATORY in the mid '80s.